Greenbank Farm was originally built in 1904 by Calvin Phillips, an insurance salesman and land developer. 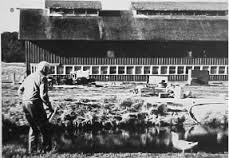 He created a model dairy farm that was one of the largest in the Northwest. By 1914 the farm had 75 Holstein cows, 80 pigs and 25 horses on 150 acres. The barn was completed in 1906 and could accommodate over 60 cows at a time. It was said the barn was the largest of it’s kind west of the Mississippi. The dairy farm met an unfortunate end in the 1930’s when a bull brought over from Port Angeles infected the entire herd with tuberculosis. John Molz purchased the farm in the early 1940’s and began planting loganberries. A loganberry is a hybrid between a blackberry and a raspberry. The berries were shipped to the American Wine Company in Seattle, the maker of Pomerelle Wines. By the 1950’s Greenbank Farm was the largest loganberry producer in the USA. In 1961 the farm produced 130 tons of berries on 78 acres and was reputed to be the world’s largest producer of loganberries. A tasting room and wine shop was opened in 1987 by Chateau Ste. Michelle, who was then the owner of the farm. 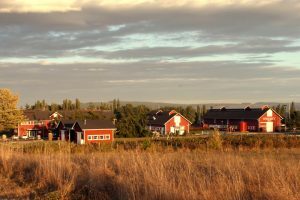 They popularized Loganberry Wine and Loganberry Liqueur, and produced these two Whidbey’s Washington beverages as well as Whidbey’s Washington Port (a Cabernet Sauvignon-based port) until they decided to sell the farm’s acreage to a developer in 1995. The developer envisioned 350 houses occupying the farmland. A grass-roots campaign to save the historic farm was started by community members in 1995 which resulted in the Port of Coupeville purchasing the farm in 1997. Under government ownership the farm has maintained it’s rural character and is open to the public. More than 5 kilometers of walking trails with breathtaking views criss-crosses the farmland hillside which doubles as an off-leash dog park. From the crest of the hillside views of the Olympic Mountain Range and Admiralty Inlet can be seen towards the east, while panoramas of the Cascade Mountain Range with Holmes Harbor and Saratoga Passage are available towards the west. From 1997 until 2015 the Port of Coupeville contracted the management of the farm to the Greenbank Farm Management Group (GFMG). The GFMG also owned and operated the Greenbank Farm Wine Shop. In the Fall of 2015 the management group sold the Wine Shop to Hollie Swanson and her parents Jerry and Terri Swanson. In January 2016, The Port of Coupeville assumed the responsibility of managing Greenbank Farm.